Ensign Media was formed in 2001 in Thailand. The company has offices in Bangkok, Phuket and Samui, and is the country's leading English language publisher. Ensign's core publications include the monthly news magazine Property Report Thailand, the annual Phuket Marine Guide, the annual Phuket For Kids, and the Culture & Cuisine series of coffee table books. Ensign also innovates in the field of electronic and web-based media and has created the property-report.com web portal, an essential one-stop-shop for real estate information and listings in Asia, and phuket-marine-guide.com, a dynamic information service for the island's marine industry. Ensign Media offers a full range of editorial consultancy, design and production services. 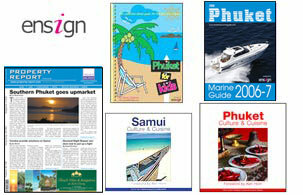 As well as creating high quality publications tailor-made to customers' requirements, Ensign can also customise its existing titles to create special editions for corporate clients -- the company has produced unique editions of Samui Culture & Cuisine for Pansea Orient Express Hotels, Bangkok Airways and Coco International Properties, and unique editions of Phuket Culture & Cuisine for Blue Canyon Country Club, Baan Rim Pa and Watermark Bar Restaurant. Ensign Media has also published unique branded editions of Property Report Thailand. Ensign Media can offer a full production service for everything from newsletters to magazines to fully bound, hardback books. In 2006 Ensign Media was contracted by Raimon Land to publish a commemorative book on the Phuket King's Cup Regatta to celebrate is 20th anniversary.